The Mudgee Triathlon Club Club is open to all levels of athletes – from those interested in completing their first triathlon to the elite triathlete. The club provides training opportunities, monthly races, information for upcoming triathlon events and a strong community bond between fellow triathletes. The Club has a membership base of over 200 members and runs a 7 series race each season. 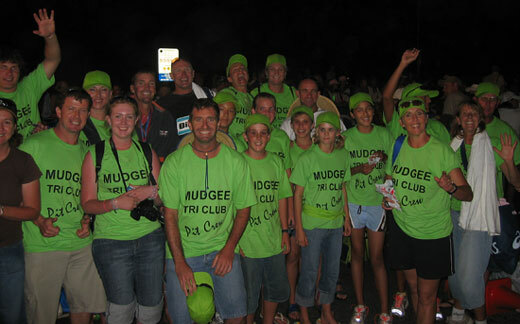 The Mudgee Triathlon Club was formed in 1996. Before this there were Duathlon, Aquathon and Triathlon races held, however these were not officially recorded. These races started in 1992 and a normal field would consist of just 10 to 15 competitors. As the numbers grew, the need was met to develop a more structured series which still maintained the friendly and social atmosphere that people had come to expect at these events. This included support for all competitors with a friendly get-together and free BBQ at the end of each race. We endeavour to cater for all levels of athletes; whether they be weekend warriors, out for a one off fitness spurt that entices them to want to do more; or the more serious competitor who wants to test his or her fitness in a competitive spirit. The Club competes in the annual Central West Interclub Challenge Shield; a competition comprising of 5 Interclub races with Dubbo, Orange, Bathurst, Cowra and Mudgee, with each town staging a race throughout the season. Mudgee is a strong contender in this competition, at one point holding the championship shield undefeated for 10 consecutive years. Mudgee Tri Club has a very strong junior core with races to suit ages from as young as 4 and upwards. Our mission is to build on our enthusiasm for the sports of swimming, cycling, running and multisports; to promote a healthy lifestyle, family participaction, and growth of our sport through our youth, membership and elite athletes.